On the blade of this ZT 0562, we see a drop point with a cutting edge just over 3.5 inches long with CPM-20CV blade steel for high edge retention. We’ve also got a two-tone finish with stonewashed flats and satin grinds. Speaking of which this knife features Rick Hinderer’s “slicer grind.” Because the grind line goes up towards the tip (instead of running parralel to the edge) it allows the edge to be stronger at the heel when you need to power through a heavy cut, and thinner out by the tip allowing it to cut more efficiently in slicing motions. 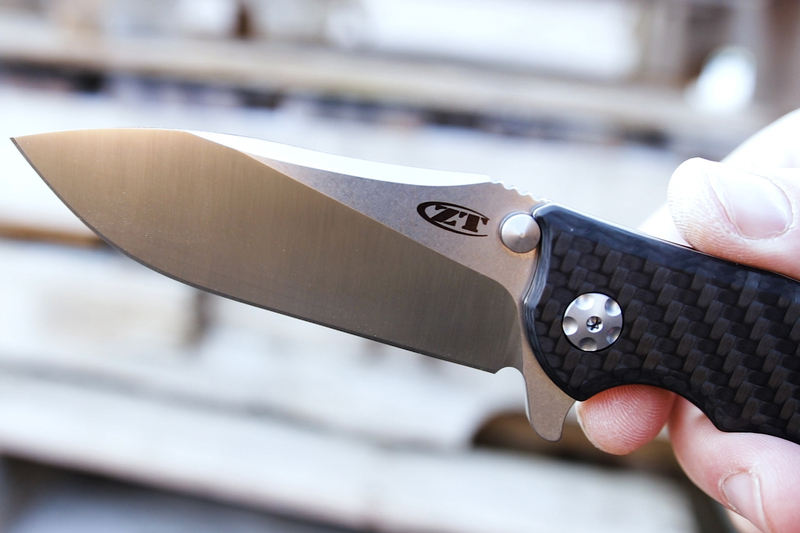 In typical ZT fashion the 0562 models are flippers and they run on a KVT ball bearing pivot system. The action is nice and crisp, sending the blade out with a solid thwack as the lock engages. Unless you’re actively trying, it is hard to not get full deployment when you actuate the blade. 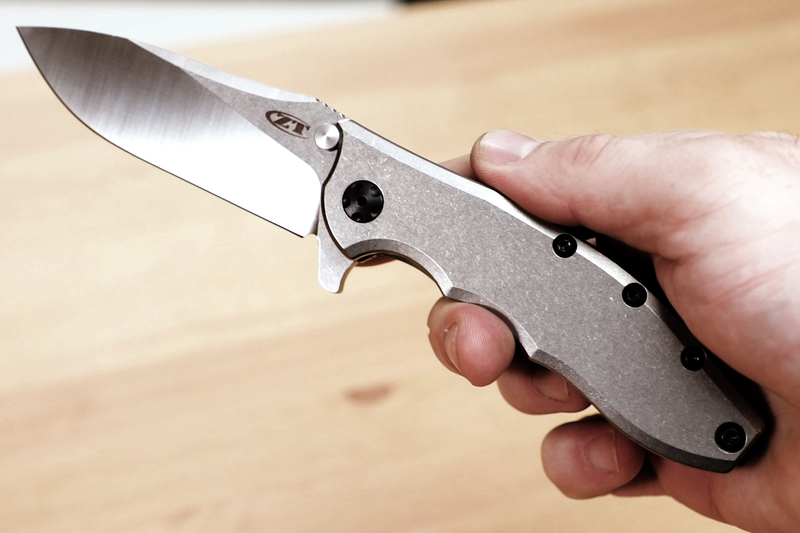 While the ZT 0562 started life with a simple G10 scale, the lineup has grown to include myriad handle options. Currently, you can get it with a Carbon Fiber front scale with the ZT 0562CF or a full stonewashed titanium frame with the ZT 0562TI. Both feature a full titanium back frame that also sports a stonewashed finish. The size of the ZT 0562 is not overly large but it is still big enough to get a nice full grip. We also get a pair of subtle finger grooves really help it to feel secure. 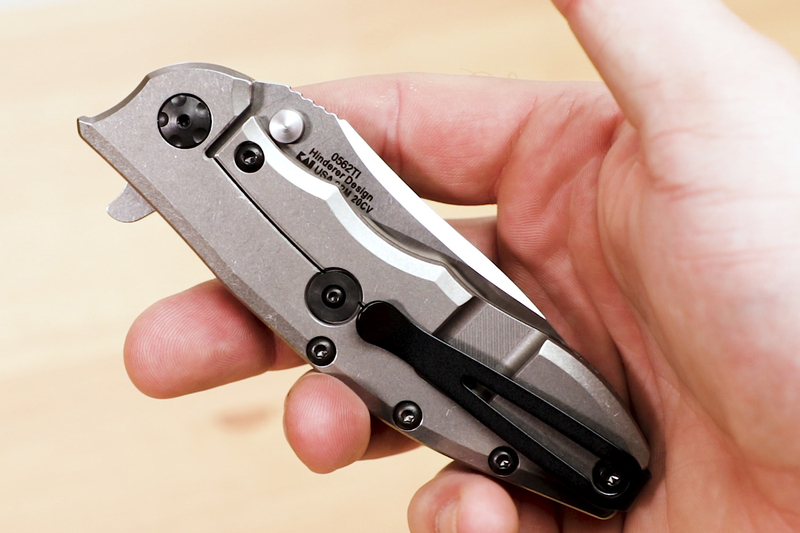 Rounding out things is a nice reversible deep carry pocket clip. It enables left or right side carry and it makes it easy to bring along this heavy-duty tool without drawing too much attention to yourself. As far as the lock itself, we get some of the hallmarks of modern frame lock design. The first is a hardened insert on the lock face itself. This helps prevent lock stick and it also creates a longer wearing surface than the otherwise bare titanium. It also utilizes an overtravel arrestor which prevents the lock bar from being bent too far back when disengaging the lock. 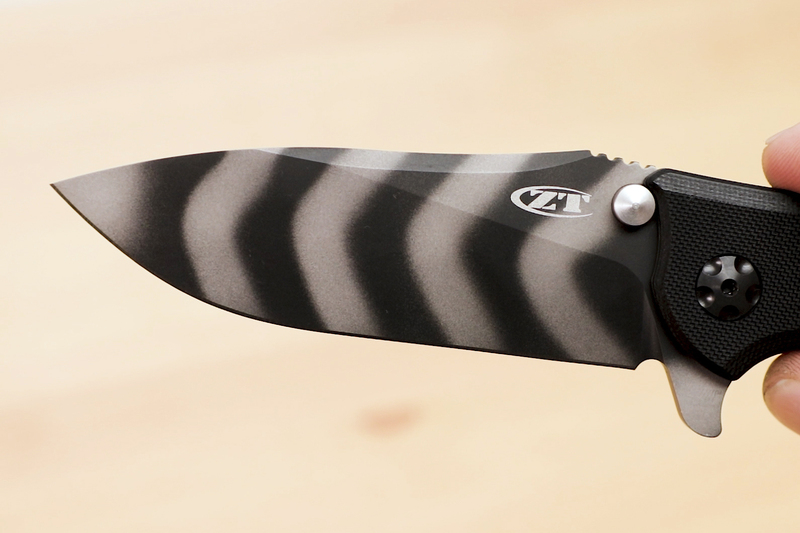 In addition to their standard models, ZT is fond of doing Sprint-Runs on some of their most popular knives and the ZT 0562 is no exception. 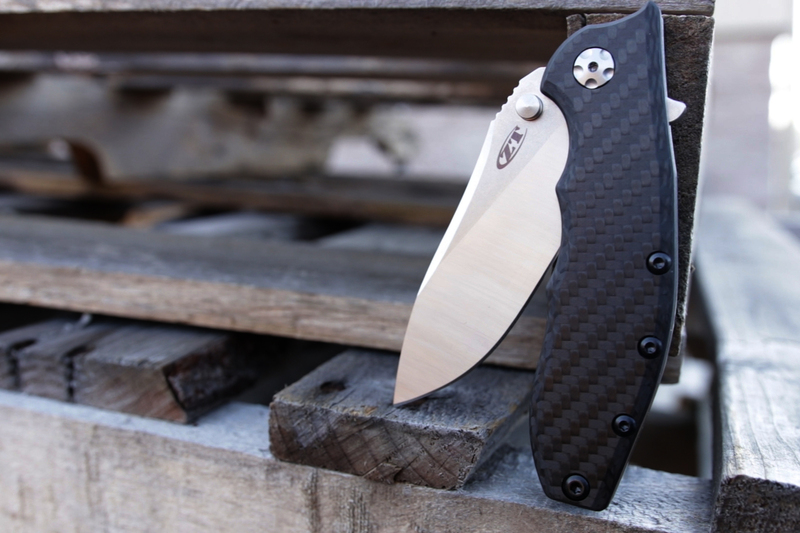 One of the most recent examples is the ZT 0562TS and like the original, we’ve got a front G10 scale. Unlike the original though, the back is DLC coated. The blade itself also sports their Tiger Stripe finish, something they were really known for in their earlier days and it makes a triumphant return on this knife. 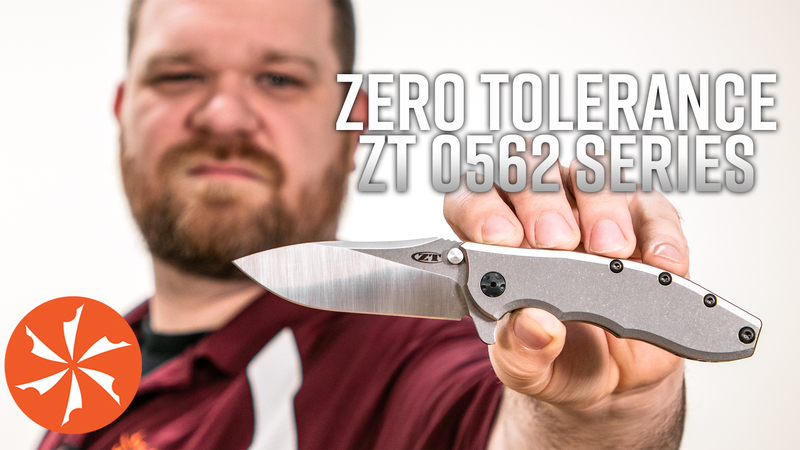 For a hard-use, overbuilt, American-made folder the ZT 0562 in any configuration is a knife that deserves to be by your side. To get your hands on one click here to head over to KnifeCenter.com.